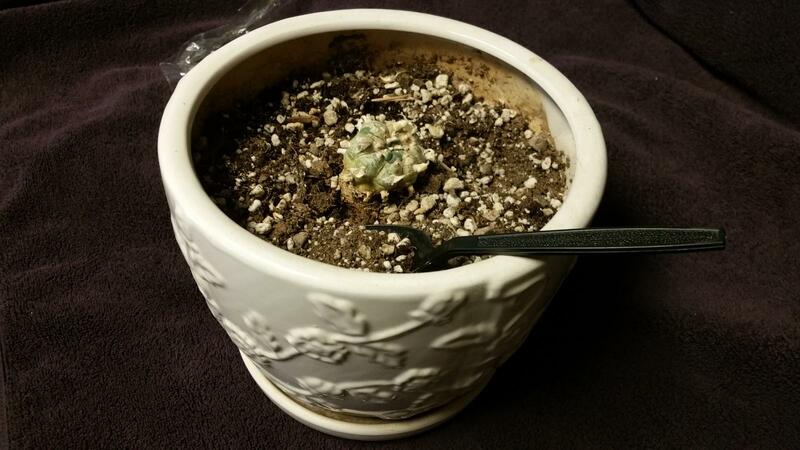 Recently, an opportunity to help out with a sick cactus presented itself so I thought I would document the process and create a thread. 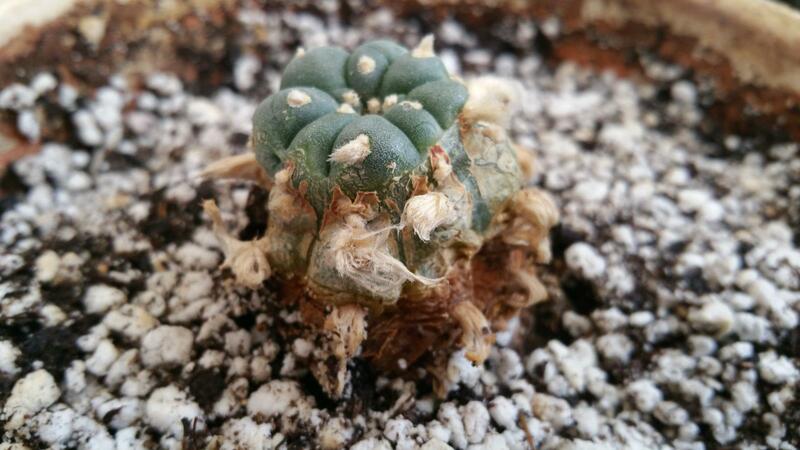 The cactus is suffering a little but still has much life to give. Over the next few days we are going to want to change a few things in regards to the environment. First off, we'll devise a new soil mix to replace the peat-based soil in which she is currently potted. 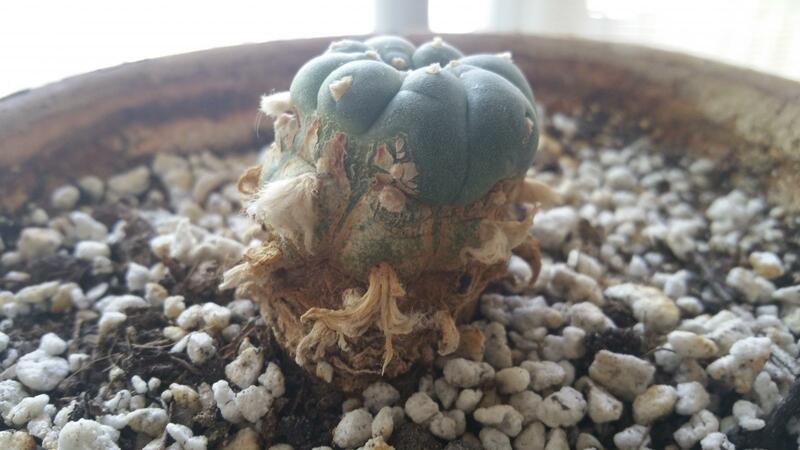 Peat based soils can become acidic over time and lophophora thrive in a more basic (higher pH) environment. 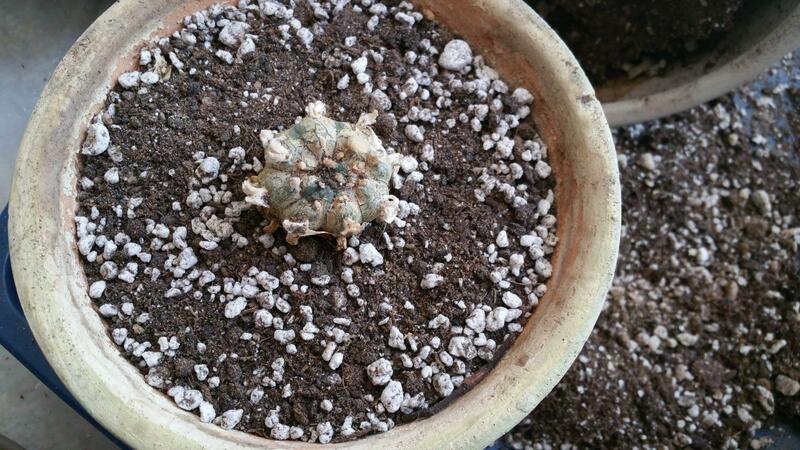 Second, we'll make sure to re-pot her into a more porous clay pot. The glazed pot in which she currently resides would be better suited for geraniums - but not cacti. Being away from a certain dog (who saw fit to periodically "water" this specimen) will do wonders in and of itself. A re-potting and revision of growth medium will help sort out any pH issues caused by soil composition and pet additives. This cactus is just coming out of winter so we should be able to see some results fairly quickly as she recovers in the new digs. I would certainly add some crushed shells to mitigate any acid build up. If you have a smaller pot, it might also help. Nice cacti, keep us posted of the progress. Edited by Spooner, 27 April 2018 - 04:35 PM. 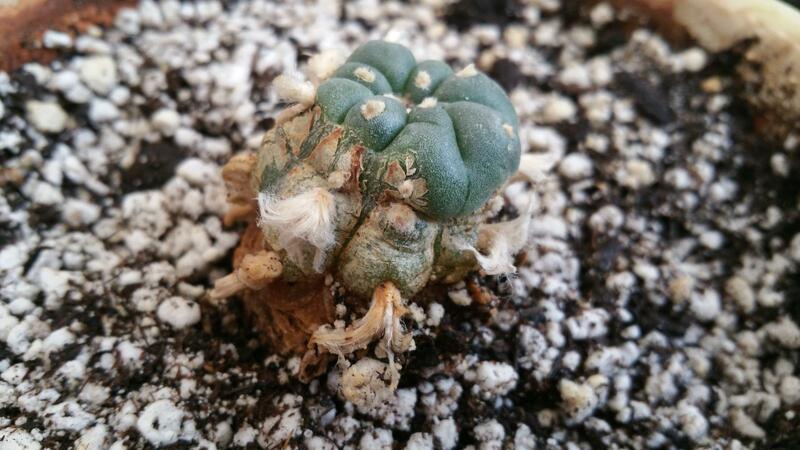 Some of the skin discoloration will improve with the potting into a soil mix that is much better suited for Lophophora, and the addition of some earthworm castings will speed the new growth for the years awakening. The new growth should look much better. I'm glad this one has found its way to your care Myc. She definitely is just a sleeping beauty! I'm finally getting back on this project. 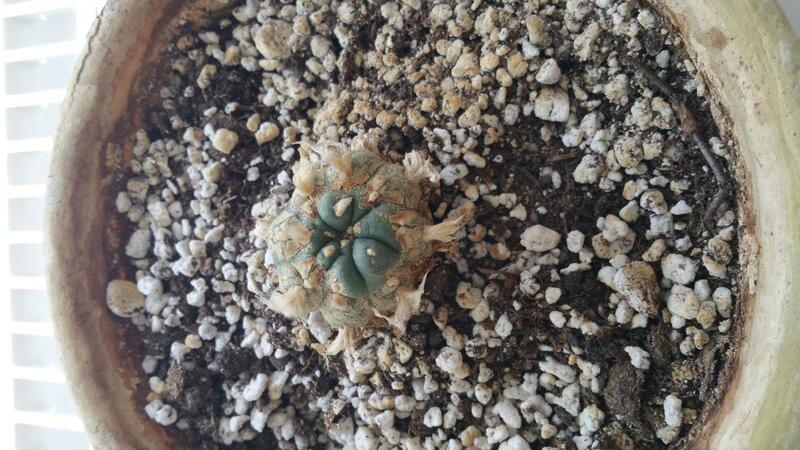 The cactus was transplanted last week and I'm curious to see how things go over the next month. While transplanting, I noticed that a slug of the original sand surrounding the root was quite impacted. 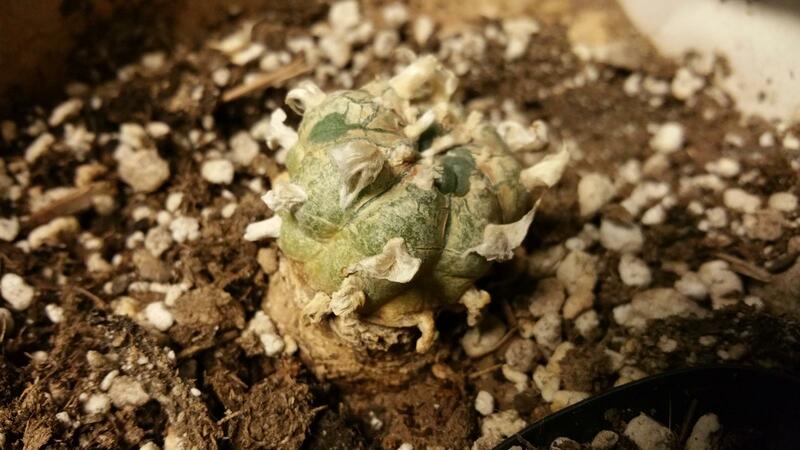 Not wanting to disturb delicate root structures while the cactus is distressed, I decided to allow the slug to soften and see if it will fall away as it sits in the new soil I've provided. It is possible that too much lime, calcium, and dog pee may have formed a natural concretion (or the beginnings of one). 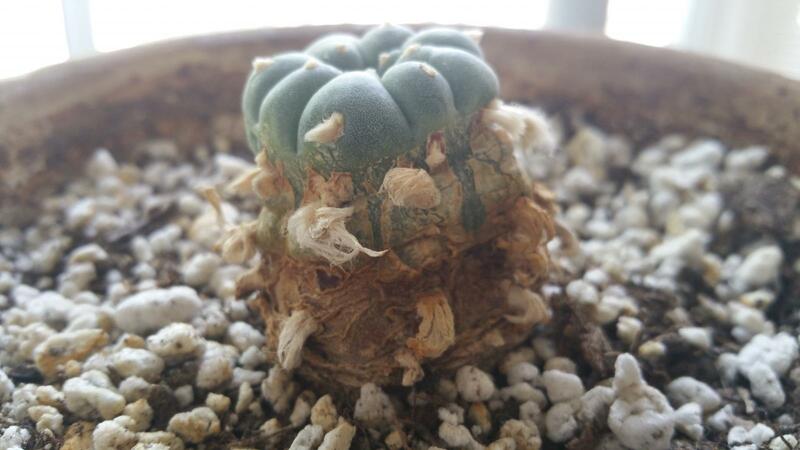 After a month, I may check again if the cactus does not appear to be recovering. 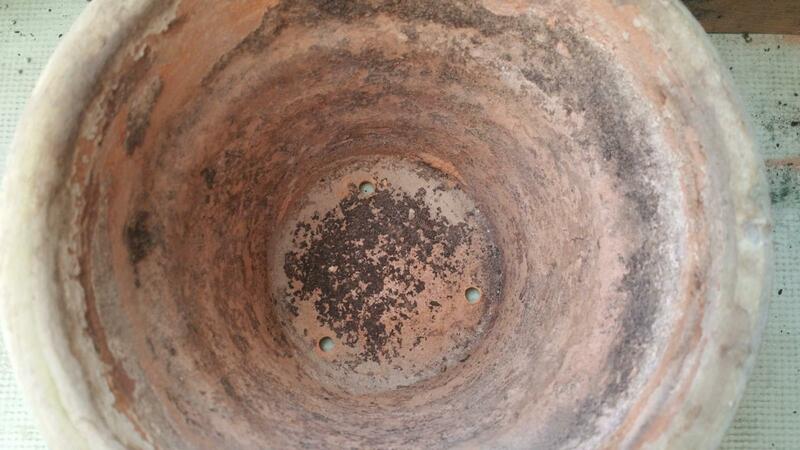 The bottom of the pot was drilled for drainage using a masonry bit. 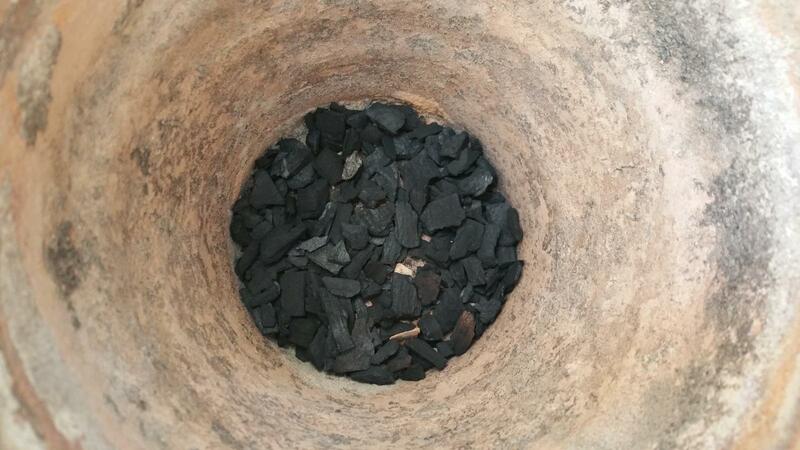 Then it was lined with a layer of crushed charcoal. On that was layered some crushed aggregate for good drainage. She received a good watering and the soil proves to drain very well. We'll give this jewel a few more weeks to see how she does. If no signs of recovery occur, I will un-pot her once again and soak the old sand concretion off with a spray bottle and some water. The idea is not to destroy the tiny fibrous roots and allow them to get into some soil which has a little phosphorous to encourage new root growth. I'm hoping the mycorrhizae in the sunshine mix will help get the soil stabilized by beginning to work on the bone meal. The soil and the transplanting seem to be working. She has been placed into partial sunshine and receives direct morning light up until about noon. The room where she is kept is quite warm during the day. I'll take care of her for a bit longer and see if she wants to go back to her original home ..... It was suggested that I might have her indefinitely. I'm hopeful that she may flower this season. Later in the summer, some azomite just might do her some good. Looking soooo much better ! I'm personally hopeful it becomes mutual for her to stay with the healing hands that brought about a turn from decline, into increase and vigor. At the rate I see of improvement, in a few years there will be little to see of that neglected, scaley base as the unblemished flesh grows over. Do they self pollinate, or do you need two different plants to get fertile seeds? They are self pollinating. It is however a good idea to play like a bee with a small paint brush in the flower, to give the best chance of getting seeds. Looks like the cactus is going to recover wonderfully. 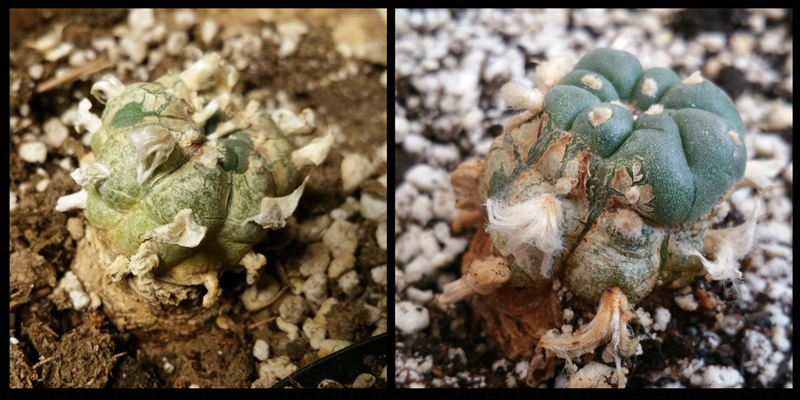 What a difference roughly 90 days can make. This little gem lives in a room whose entire Eastern face is glass. She gets morning sun up until around noon. The room is not environmentally controlled and temperatures range from roughly 90*F during the day down to 60*F at night. Throughout the day the room continues to be flooded with ambient light. She gets water - plain, room ambient temperature water - every 20 days or so. Roughly, every 3 weeks. It's wonderful to observe that she's slowly shedding all of that dried skin. Another season or two and we won't even be able to tell she was having a tough time!! The soil mix is quite excellent. Plenty of nutrition without being too "hot". Very fast draining soil. Just continue to add water until it begins to run out the bottom of the pot. Immediately cease pouring at that point and allow the soil to stabilize. Over the next several hours, the seepage from the bottom of the pot will wick back into the dry soil. Another important thing with cacti is to just watch them and let them be. What a dramatic difference ! Edited by Skywatcher, 31 July 2018 - 03:26 PM. I've observed that wild cacti - after having had a particularly harsh stretch - once watered thoroughly - tend to produce an abundance of flowers. It's crazy seeing all these scabby, beat-up, brown cacti suddenly turn vivid green and start kicking off the color display! The poor baby looks better. I like your soil mix recipe it seems like a good substitute for her natural habitat. Good luck with the flowering. Just a little monthly update. The cactus is watered about once every 21 days during the summer heat. As temperatures cool, the soil is staying moist longer. Maybe one more watering before Winter and that's it until next April / May. I'm really impressed by how tall this plant is. She must have been starved for water something awful. I'm further lucky in that L. diffusa is notoriously sensitive to stress. They're prone to crown rot and other diseases when stressed and rarely survive. Looks like this little jewel is going to make it just fine. They do come from places that have a lot of limestone in the soil. 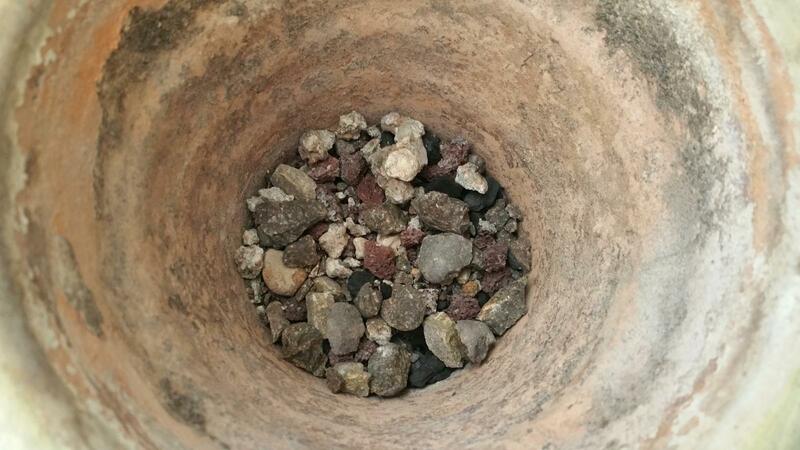 Maybe try a mix of decomposed granite and limestone. 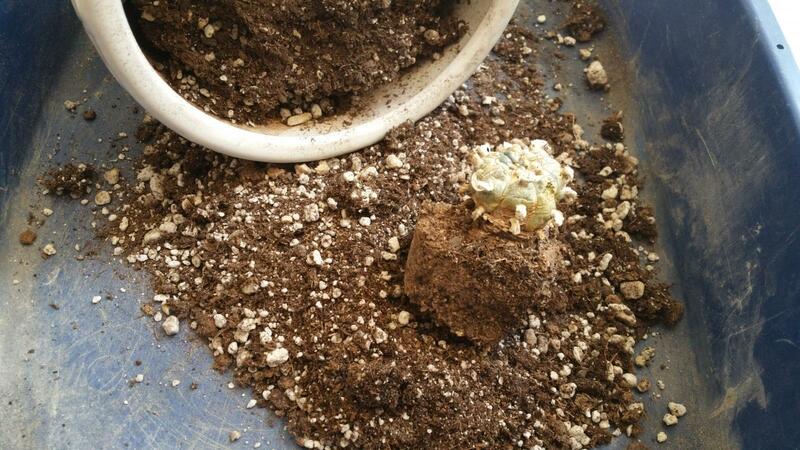 I use decomposed granite for my trichocereus cacti. It drains well. That's a really great suggestion! I use the decomposed granite for my trichos also! Then I go rob an ant bed of some of its litter pile. All of those perfectly sized stones work great for top-dressing the pots. I am actually surprised at how she is now on top. Great job saving her Myc.